The award-wining SE Spa at Grand Velas Riviera Maya is now offering a new therapeutic Christmas Ginger Herbal Bliss spa treatment that exudes festive fragrances for the holiday season. The award-wining SE Spa at Grand Velas Riviera Maya is now offering a new therapeutic spa treatment that exudes festive fragrances for the holiday season. 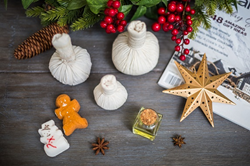 The Christmas Ginger Herbal Bliss (80 min / $236 USD) features herbal poultices filled with steaming anise, cinnamon, orange, ginger and lemongrass that fill the air with subtle aromas. These healing herbal poultices are applied to one’s face and body in a rolling, kneading motion, gently warming the muscles and preparing the skin for a massage with ginger-infused oil. The herbal poultices help reduce aches, pains, and muscle soreness and condition the skin. Blended with the relaxing massage, working from feet through neck & face, the treatment also enhances one’s overall mood. The experience concludes with a Mayan Cacao & Cinnamon signature drink. Each treatment at Se Spa (of 50 minutes or more) includes an hour-long Water Journey, a relaxation ritual built around the use of the seven, specially designed water-based facilities. These custom-designed amenities include a Clay Room, circular glass-tile-lined steam room with a fiber-optic “star light” ceiling, Ice Room with floor-to-ceiling window, and hot-and-cold Experience Showers. A central infinity pool has powerful massaging faucets throughout and carved-stone chaises with jets set just underneath the surface of the water on which guests recline. A spa valet provides bottled water and towels but most importantly guidance. Resort rates start at $463 per person per night based on double occupancy and include luxury suite accommodations, à la carte gourmet meals at a variety of specialty restaurants, premium branded beverages, 24-hour in-suite service, fitness center, taxes, gratuity and more. For reservations or additional information, call 1-888-407-4869, or visit https://rivieramaya.grandvelas.com/.